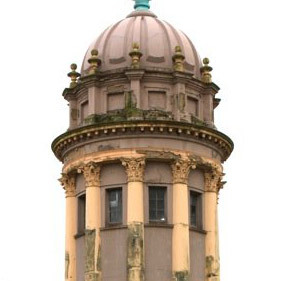 The Pepper Pot is a grade II listed building which was built in 1830 from a design by Charles Barry. It is constructed of the patented ‘Rangers Artificial Stone’ one of the earliest examples of Lime concrete block construction. 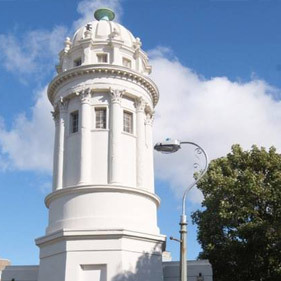 The building has had a variety of uses since its construction including an observation tower, print shop for the ‘Brighton Daily Mail’, sewer pipe vent and artist studio. 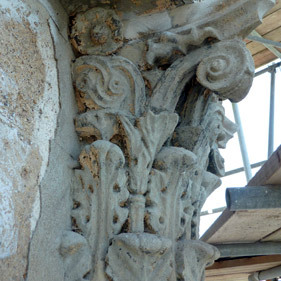 In 2011 STRESS Heritage was invited to assist in the conservation of the structure. 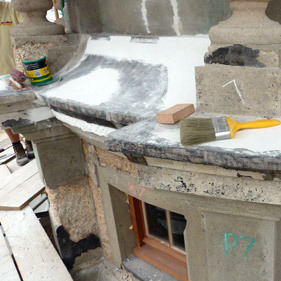 The original works were to remove the applied ‘Turnerisation’ to the Rangers façade to enable the structure to breathe. 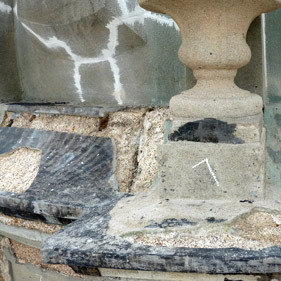 After the Turnerisation was removed it was found that the structure was in much worse condition than first anticipated. The Turnerisation had caused rainwater to become trapped between the applied surface and the Rangers artificial stone. The resultant accelerated decay had caused the face of the Rangers to dissolve leaving the major areas of the interior of the block work unprotected. Our carefully designed solutions enabled conservation and repair of vulnerable elements of the structure using a variety of Lime based materials. Although finance was not available to complete the listed building restoration in it’s entirety it is hoped that future funding will enable further works to be undertaken. Soon after Stress had finished, the heritage structure was used for a community light show entitled ‘Tower of Dreams’ by a Shared Light and Space production to exhibit ideas from the community for new uses for The Pepperpot. Large areas of the ‘Rangers’ artificial stone were badly degraded leaving the interior fabric exposed. The decision was made to conserve any vertical surfaces as found and to repair all horizontal surfaces with St Astier Lithomex. 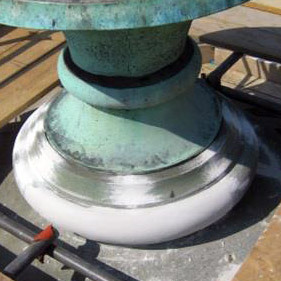 The Pepperpot was then treated using the Keim mineral paint system enabling further repair when funding became available. 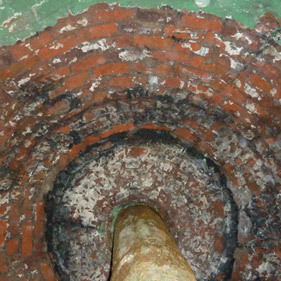 Parts of the masonry had suffered severe signs of age, stress and decay. 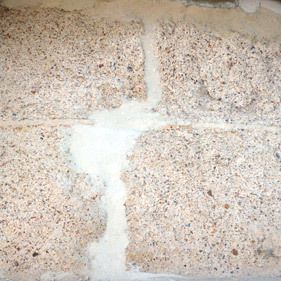 Fine cracks in the masonry were filled using Keim Spachtel and larger areas were repaired and reprofiled using the Lithomex. The structure was damaged throughout which masked the fine details of the period design. The horizontal surfaces were cutback to remove any loose material but retaining as much of the original as possible. Each individual repair sought to maintain the profile accurately. 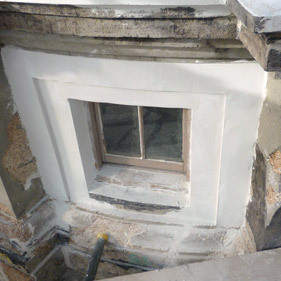 The second floor windows had previously been removed ready for replacement prior to STRESS’s involvement. 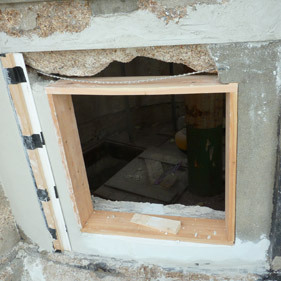 The action of removing the windows had further disturbed the substrate revealing just how fragile the structure was. To enable the new windows to be installed additional extensive repairs had to be carried out to the openings. The capitols were in an extremely vulnerable state. 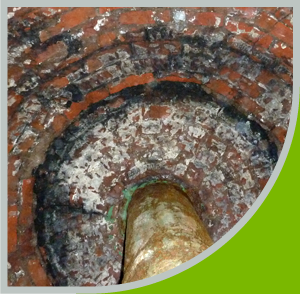 Each one was carefully examined and a variety of repairs carried out within the limited budget. 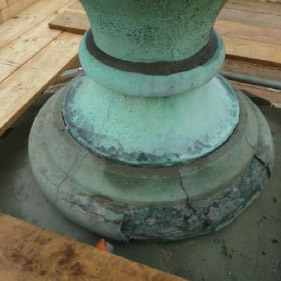 In-situ plastic repairs were completed where possible but in some cases parts of the capitols had deteriorated to such an extent that portions of them had been removed from the structure for safety reasons. As many as possible were secured back in position and repaired. Areas between the block of ‘Rangers’ were pointed in with a lime mortar to create a finish flush with the existing surface. This was to ensure that the remaining fabric was protected from further weathering and water ingress. The interior fabric of the structure was found to be wet, partly due to the Turnerisation and partly a hard cement render on the inside of the structure. To assist in allowing the structure to breathe and dry out, the cement render was carefully removed from the interior to allow the moisture to dissipate. The grade II listed building is now another step closer to it’s original 1830s image.